Above: Intel Philippines Country Manager Calum Chisholm giving an overview of the range of mobile devices Intel is powering today. There’s no need to stress out on choosing an OS – Windows or Android – when you can have both on a myriad selection of devices and price points. 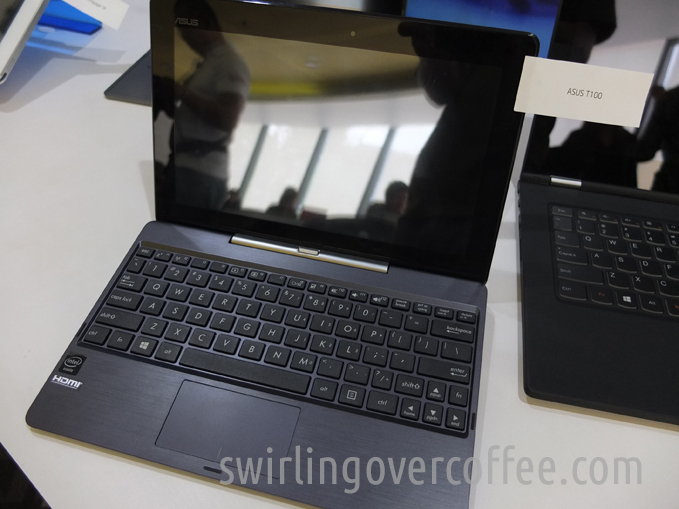 Some, like the ASUS Transformer Book Trio (below), even runs both. 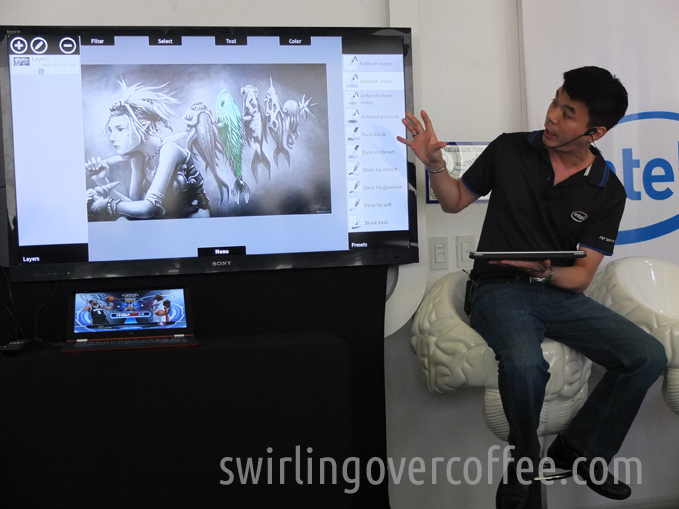 Above: Jason Dayrit of both Kristn.com and twenty8two holds the display of the Transformer Book Trio running a graphic intensive game, and yet not even giving signs of stutters or hiccups. Polkadots on the display are my fault. It’s a reflection of the tray I was holding. Above: The Dell XPS 12 2-in-1 Ultrabook Convertible. The frame holding the display has a hinge that lets you flip the screen. That way when you close the lid with the display facing the other way, you get a thick tablet. Above: The ASUS Transformer T100, one of the most (if not the) most affordable and visible (I’ve seen lots of people lugging this around) convertible Windows 8.1 devices around. 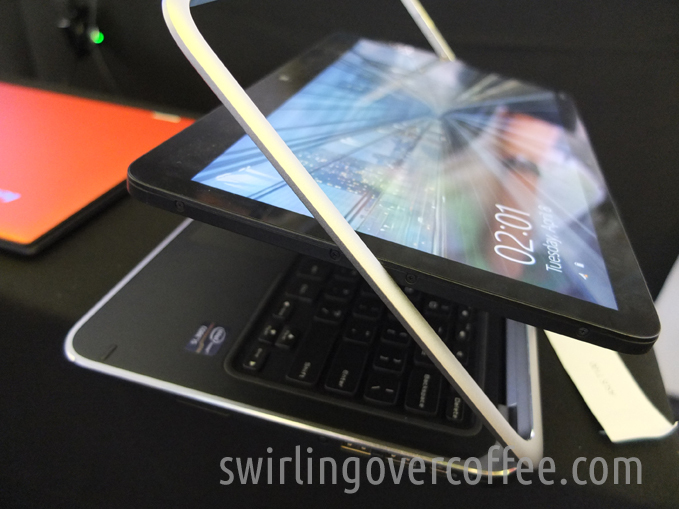 Convertible because the display can be pulled out from the keyboard dock to act as a stand alone Windows 8.1 tablet. The battery lasts a whopping 10 hours. The dock provides the comfy familiarity of a tactile keyboard and trackpad and an expansive 500GB of SATA storage. Sold at P24k and bundled with both MS Office 2013 (Home and Student) plus free ASUS online storage, it’s incredibly hard to argue against the value-for-money offer this laptop-hybrid offers. 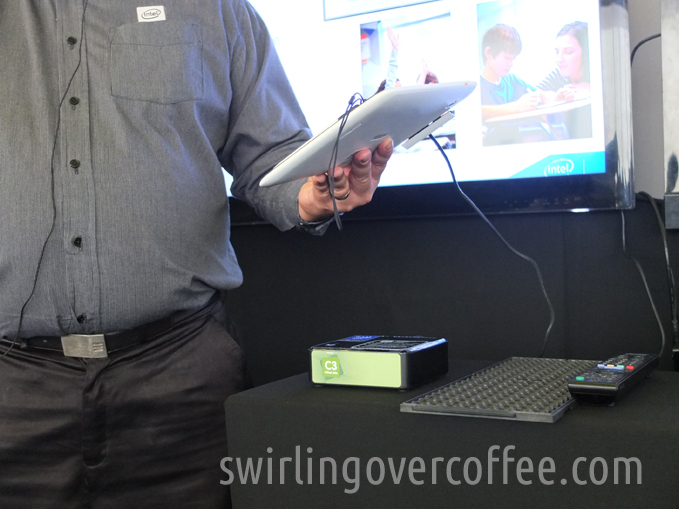 The C3 microserver (above, the small box) is demonstrated to a room-full of media reps, some of whom thought that, because of the loading time and responsiveness of the online tools shown, that all these were online. No, they’re all saved, cached, and residing in the C3 microserver designed for areas with only a trickle of bandwidth. That way, the educators can set up the microserver to save webpages and online tools while it runs all night, which can then, the day after, in front of students, “serve” as the Internet itself. (The overnight download is an assumed scenario where it takes forever to load a webpage.) Of course the hardware shown was only one aspect, as there are also the free and paid-for educational resources as well as the proprietary software owned by Intel. But imagine how great this could be for remote areas. Also, the tablet shown above is ruggedized so that teachers won’t be afraid to use them (and drop them). This is a great add on, because many cheap tablets today die a sudden death when they are dropped. Above is the tablet version of an image editing tool. 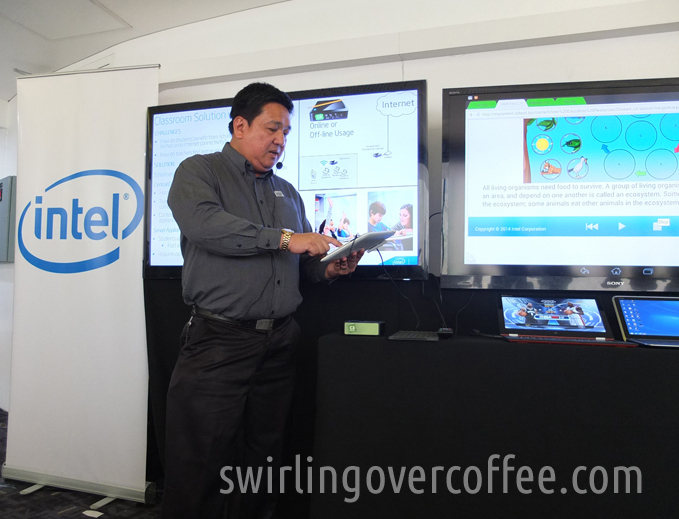 The interface changed to tablet-optimized version when the Dell XPS 12 was changed to its tablet mode from laptop mode. In laptop mode, the editing tool would show the usual side and hover icons as you would see them on a desktop-optimized app. But sometimes we want to use our fingers or a stylus – some find that more intuitive – when working with colors and images and drawings. Hence, the option to flip from desktop app to touch-ready app. Above: The tablets below that portrait oriented display – ignore them. 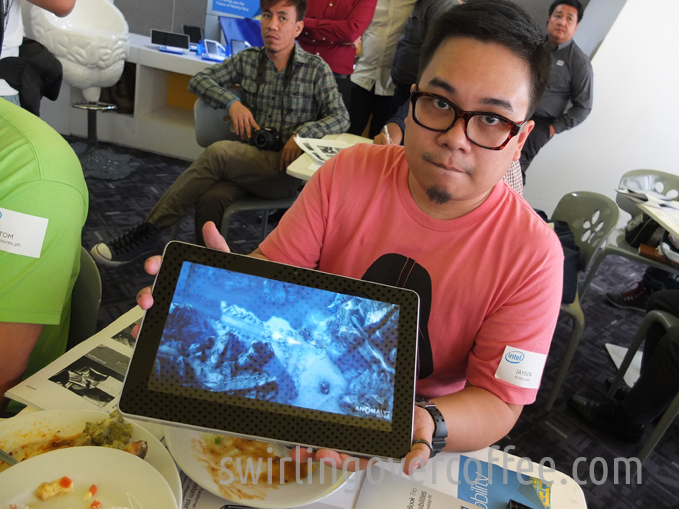 Above them is the mirrored image of an app running on the ASUS Fonepad 7 (dual SIM), called SARILOAD developed by sari. It’s a smartphone-based loading platform that shortens loading processes, minimizes errors, stores “suki” numbers, tags and tracks debt and “utangs”, and tracks profit. Great for the financial education of small “tindahan” owners. Above: Another app by sari called Product I/O wherein the ASUS Fonepad 7 becomes, along with a barcode scanner, a portable Inventory Management Solution for vendors. 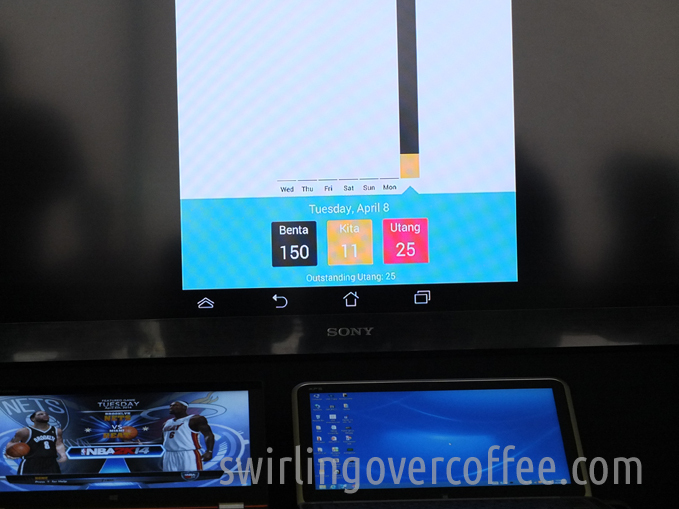 They’ve already pilot tested the app and a demo involving Dunkin Donuts was shown. 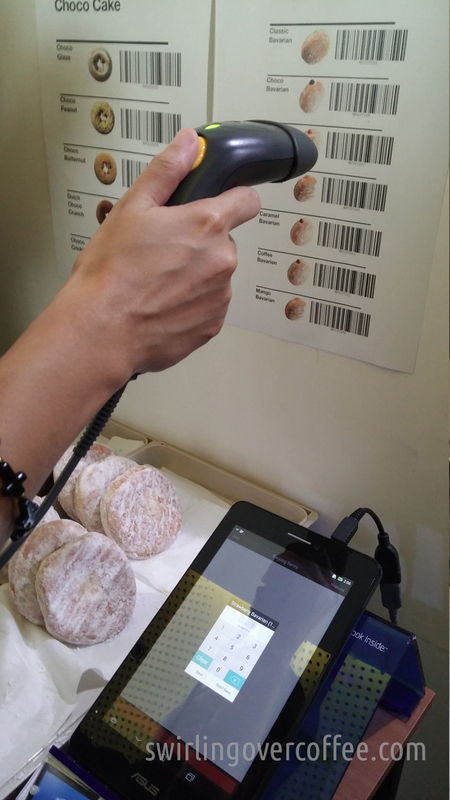 A person points at the donuts she wants to buy, the attendants scans the barcodes of the chosen donuts, and the details are punched into the phablet – everything logged, tracked, and data collected can reflect the items that sell poorly or too well and in which location during what days of the week. Reduces theft and product spoilage. My eyes literally lit up during the demo. No more ka-chings! of cash registers and pen and paper logbooks and Excel spreadsheets whose versions you can never track. Well, you get the idea. 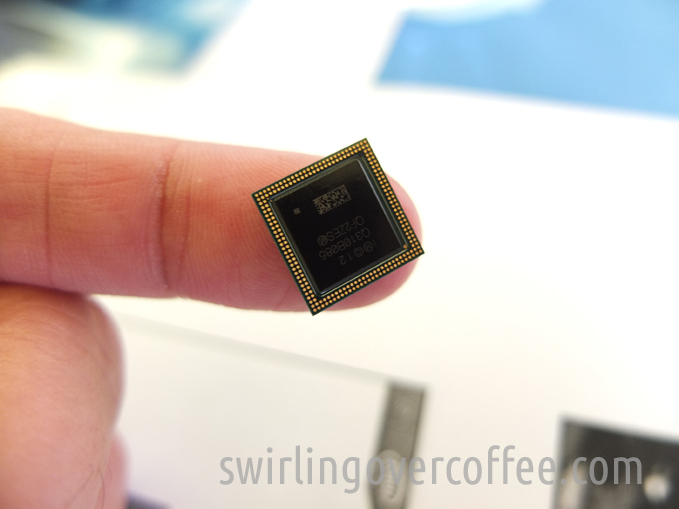 Above: the Intel Merrifield Chip. Above: Naturally, the affordable mobile price points are dominated by Android device. 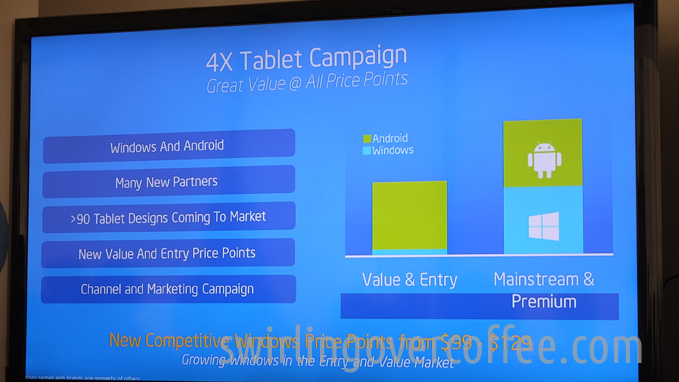 But Intel sees growth in the premium side where both Windows 8 and Android are needed. 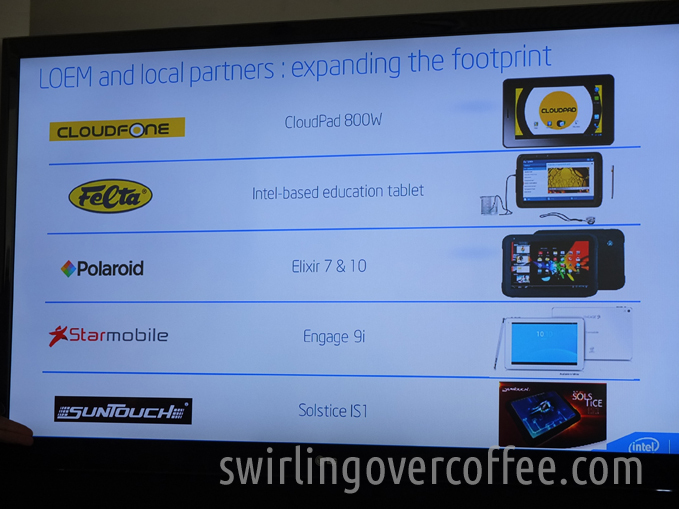 Above: Local partner-manufacturers whose mobile products run Intel inside. Two of the most recommended Android tablets – the CloudPad 800W and the Starmobile Engage 91 – are on the list. 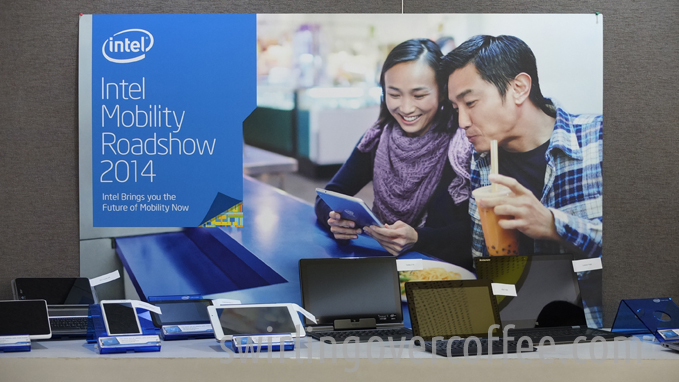 The Intel Mobility Roadshow 2014 was held at the Mind Museum. We’re looking forward to next year’s showcase. 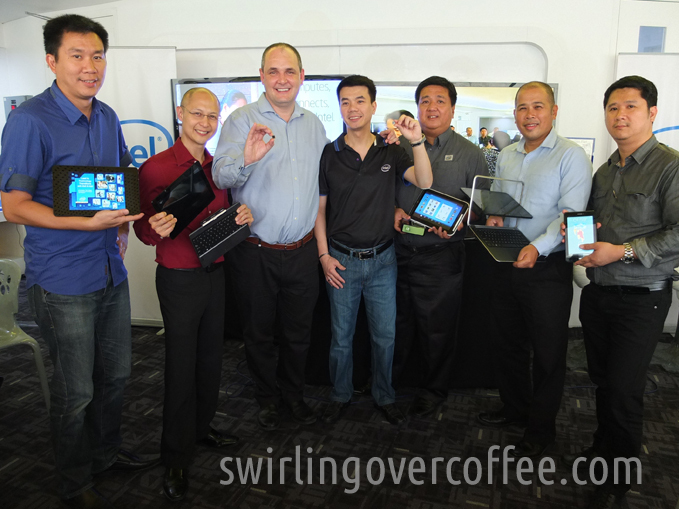 Intel executives at the event.